This description of the Thumper air circuit is provided in Question - Answer Format. Although there are many details in this description, if you want to really get down and dirty, you need to go the Cricket Air Circuit pages and read the Long Story about the Cricket air circuit. The Thumper air circuit is identical to the Cricket air circuit (less the Air Gate, which supports the single-hit and clamp features). The Cricket pages contain much more information about the components, how they work and what their responsibilities are. What are the Basics of How the Air Circuit on a Utility Air Hammer Works? The core design of an Air Circuit is actually a fairly simple concept. A ram is connected to the rod on a double-acting cylinder. The cylinder has two external ports (front and rear) and an internal piston with an attached rod extending through the front of the cylinder. Pressurized air that enters the rear of the cylinder pushes on the piston and moves it toward the front of the cylinder… pushing the rod out the front of the cylinder, and moving the Ram away from the cylinder (down). Conversely, when pressurized air enters the front of the cylinder, it pushes the piston back toward the rear of the cylinder, retracting the rod into the cylinder and moving the Ram back toward the cylinder (up). This sequence is repeated over and over, cycling the ram, allowing the operator to forge objects. While air is being pushed into one end of the cylinder, the air on the opposite side of the piston is being pushed (by the piston) out the other end of the cylinder. This air is routed out of the Air Circuit to a muffler. What Controls the Air Movement through the Air Circuit? This involves discussion of several separate actions. Each action, and its associated components will be discussed in the following paragraphs. A series of valves that are inter-connected (with fittings and hoses) interact with one another to control the flow and volume of air passing through the Air Circuit. Butterfly Valves are used on the front (to turn on the Thumper... ie. let pressurized air get to the Thumper) and rear end of the Air Circuit (used to control the exit of air from the air circuit). They will (hereafter) be referred to as “Butterfly Valve 1” (at the front of the air circuit) and “Butterfly Valve 2” (at the end of the air circuit) respectively. A butterfly valve is similar in function to a common ball valve in operation. The difference is that the butterfly valve has a wafer inside (to allow air passage) instead of a ball. A butterfly valve is used in lieu of a ball valve because the volume of air allowed through is more proportional to the handle movement than the ball valve is. This difference allows much better control of the hammer. Pressurized air enters the front of the Air Circuit (Air Input Side through Butterfly Valve 1) and exits the back end of the Air Circuit (Exhaust side through Butterfly valve 2). Will the Ram start cycling when Butterfly Valve 1 is opened? It shouldn’t…. and if the treadle is in its fully-up position (and everything is working properly), it will not. The Ram will however, rise a little and remain stationary (why it does this is explained later). Opening Butterfly Valve 1 “Charges” the air circuit with pressurized air. It does not initiate cycling. It only prepares the circuit to be able to quickly initiate cycling. When does the cycling begin? After Butterfly Valve 1 is opened, the Thumper is ready to begin cycling. The Ram will begin to cycle when the operator presses down on the Treadle. The lever on Butterfly Valve 2 is connected (via chain linkage) to the treadle. Butterfly Valve 2 is opened and closed by movement of the treadle. Butterfly Valve 2 is used to control the volume of air passing through the Air Circuit. When Butterfly Valve 2 is closed, no air is passing through the air circuit (no cycling is occurring). When Butterfly Valve 1 is opened to turn on the Thumper, it doesn’t immediately result in air continuously passing through the air circuit…. It only allows air to enter the air circuit, pressurizing it. If Butterfly Valve 2 is opened a little (a little treadle movement)…. A little air (think volume) is allowed to flow through the air circuit. If Butterfly Valve 2 is opened a lot…. A massive volume of air can flow through the air circuit. The amount of air (in volume) allowed through the air circuit is (ideally) proportional to the amount Butterfly Valve 2 is opened. 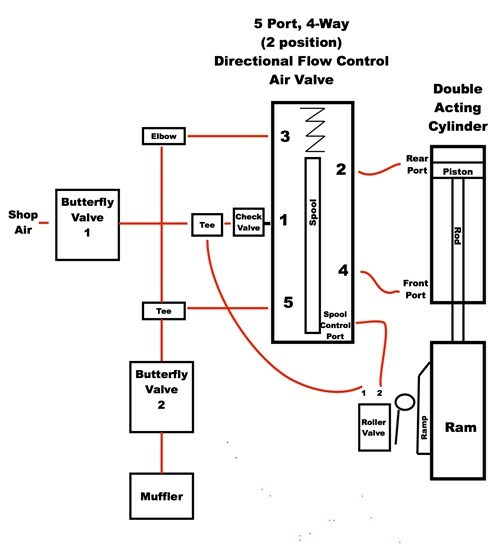 So far, I have described components (butterfly valves) that control the entry, exit and volume of pressurized air that passes through the air circuit. It should be understood that the “Primary Control” of the air passing through the air circuit is at Butterfly Valve 2. Think about the volume of pressurized air moving through the Air Circuit as being “metered” by Butterfly Valve 2. You seem obsessed with volume…. Why is the volume of air passing through the air circuit important? Earlier, it was disclosed that air enters the the rear of the cylinder to push the ram down…. and air enters the front of the cylinder to push the ram back up. Air volume is significant because it takes a specific amount of air (in volume) to move the ram each way. Think of the amount of air (in volume) it takes to move the ram each way as a “Gulp” of air. If a single gulp of air passes through the air circuit every second, the ram could (potentially) cycle 30 times a minute (it takes 2 gulps to cycle). When the treadle is in its fully-up position, no pressurized air is moving through the air circuit (Butterfly Valve 2 is closed). As the treadle is pressed down, Butterfly Valve 2 is opened further and further, allowing an increasing volume of air to flow through the air circuit. When the treadle is pressed just a bit, only a few gulps of air (per minute) will flow through, cycling the ram slowly. As the treadle is pressed down more, more gulps of air (per minute) flow through and the ram cycles faster. When Butterfly Valve 2 is fully opened, the ram will cycle in excess of 200 times a minute. OK…. I understand that air enters and exits the air circuit, but discussing simple air flow doesn’t account for the Ram dynamically changing direction. What makes that happen? This is where we discuss the “Heart” of the Air Circuit. There is a Directional Flow Control Valve (hereafter referred to as the “4-Way Valve”) that manages the cylinder changing direction. The treadle is in its fully-up position (resulting in Butterfly Valve 2 being closed). Butterfly Valve 1 is closed. The upper die is sitting (at rest) on the lower die… This means the cylinder rod is extended, the ram is down and the cylinder piston is near the front of the cylinder. To raise the ram, pressurized air will have to enter the front port of the cylinder. As shown in the diagram, the 4-Way Valve has hose connections to the front and rear of the cylinder. When the hammer is actively forging (ram cycling), pressurized air is rushing into the Air Circuit, entering the 4-Way Valve and is routed to either the front or rear of the cylinder. Initially, when the operator opens Butterfly Valve 1 (to turn on Thumper), the 4-Way Valve is conditioned to route incoming air to the front of the cylinder. Pressurized air enters the Air Circuit until the air in the Air Circuit equalizes to the pressure coming from the air source (remember, Butterfly Valve 2 is closed and prevents continuous air flow through the Air Circuit). As Butterfly Valve 1 is opened slowly, the Air Circuit is filled with pressurized air. Generally, this will be enough air movement (in volume) to push the ram up. This is why the Ram rises when Butterfly Valve 1 is opened. What do you mean when you say the 4-Way Valve is “Conditioned”? The 4-Way Valve has an internal (movable) mechanism, called a “spool”, which moves in a sleeve and configures the air pathways through the 4-Way Valve. The spool has two positions. When it’s in its initial position (as it will be when there is no pressurized air in the Air Circuit), pressurized air coming into the 4-Way valve is routed to the front of the cylinder (raising the ram). As the operator presses down on the treadle, the spool moves to its alternate position. This action “re-routes” the air flowing through the 4-Way Valve to the rear end of the cylinder, and causes the Ram to move down. That only accounts for a single change in the direction the cylinder is moving. How is cycling of the Ram accomplished? Actually…. As long as the treadle is pressed and held down, the spool moves back and forth continuously, dynamically changing the path that air is flowing through the 4-Way Valve. I assume something is controlling the spool… ​How does the spool know when to move to its alternate position? The spool is held in its initial position by a spring (pushing against one end). It is moved to its alternate position by pressurized air being delivered to the spool control port. A second air valve, identified as the Roller Valve, is monitoring the position of the moving Ram. When the Roller Valve detects it’s time to change the direction the Ram is moving, it sends a signal (in the form of forwarding or releasing pressurized air) to the 4-Way Valve to change the position of the spool. How does the Roller Valve detect when it’s time to send the signal?…. And exactly what is that signal? Picture this…. The Ram has a ramp-dock (an inclined plane rising to a platform) on its front side. Physically, it’s part of the ram, so it moves up and down with the Ram. The Roller Valve, which stays stationary during forging operations, is positioned in front of the ram and will interact with the ramp-dock when the Ram is moving. Initially, when Thumper is off, the ram is down and the ramp-dock is below the Roller Valve. The Roller Valve has a spring-loaded lever on the side facing the ram (with a roller on the end). As the Ram is moving up, the ramp encounters the Roller Valve and pushes in the Roller Valve lever (the roller is on the dock). At this time, a signal is sent to the 4-Way Valve. That signal is pressurized air that is forwarded to the 4-Way Valve’s spool control port. This pressurized air moves the spool to its alternate position, which reverses air flow to the ends of the cylinder and initiates changing the direction the ram is traveling. The pressurized air (present at the spool control port) will be sustained as long as the roller (on the Roller Valve lever) is on the dock. The Roller Valve lever will stay in (the roller is on the dock) until the ram changes direction (starts moving down) and the dock moves past the Roller valve on the way down. As the ramp moves past the Roller Valve, it lets out the Roller Valve lever. As the lever moves out, the pressurized air in the hose going to the 4-Way Valve is exhausted (relieved)…. Since there no longer is pressurized air at the spool control port (on the 4-Way Valve), the spool moves back to its normal position (initiating changing the direction the ram is moving. What is the source for the pressurized air that the Roller Valve forwards to the 4-Way Valve? Look at the diagram at the front of this document. It shows there is a tee just after Butterfly Valve 1. When Butterfly Valve is opened, pressurized air is forwarded to both the 4-Way valve AND the Roller Valve (separate paths). When the lever on the Roller Valve is out, that pressurized air is blocked at the Roller Valve. When the lever is pressed in, the pressurized air passes through the Roller Valve and is forwarded to the Spool Control Port on the 4-Way Valve. Is there a ramp for both the top and bottom of the stroke? No, with this Air Circuit design, there is a single ramp, which identifies the Nominal Center of the Stroke. If someone builds an air hammer with a long stroke cylinder and wants to have longer stroke than this type of air circuit allows, two Roller Valves could be used (one at the top of the stroke, the other at the bottom of the stroke). This would require a different 4-Way Valve (with a spool control port on both ends of the 4-Way Valve). If there is only one Ramp, and a signal is sent to change the direction of the Ram when it is encountered, it seems like the stroke would be very short. What happens to allow the stroke to be long enough for forging? While it’s true that… When the Roller Valve sends the signal, the internal pathways in the 4-Way Valve are immediately reconfigured (and air is rerouted to the opposite end of the cylinder), the Ram does not immediately reverse direction. It momentarily continues in the same direction (due to momentum) before it reverses direction. This action provides for half the stroke distance. The distance traversed is dependent upon how much air is trapped ahead of the piston in the cylinder and the pressure of the air entering to reverse the direction the Ram is moving. The air ahead of the piston is trapped by the Check Valve and is further compressed as the Ram continues moving before it reverses direction. This additional compression provides a direct performance boost for forging and planishing. One more thing…. When the cylinder changes direction, air is being routed to the front or rear of the cylinder’s piston. As the cylinder’s internal piston is being moved, the air ahead of it has to go somewhere. Where does that air go? It goes out the side of the cylinder and is used to blow up balloons…. If you believe that, I have some ocean side property in Arizona I want to sell you. The real story… The spool reconfigures pathways in the 4-Way Valve for exhausting air from the cylinder as well as loading the cylinder. As the 4-Way Valve is routing air into the cylinder, the air being pushed out by the piston is routed back through the 4-Way Valve toward a muffler. As strange as it may sound, this is where the magic occurs. It’s in this path of “exhaust air flow” Butterfly Valve 2 resides. The whole action of the Air Circuit is controlled by the volume of pressurized air allowed allowed to flow through Butterfly Valve 2. When Butterfly Valve 1 is opened, it only charges the air circuit, it does not initiate ram cycling. When the roller valve encounters the ramp, it forwards or releases pressurized air to signal the 4-Way valve to initiate changing the direction the ram is moving. When Butterfly Valve 2 is closed, the ram cannot cycle because no air is being let through Butterfly Valve 2. Pressing down on the treadle opens Butterfly Valve 2, allowing pressurized air to flow through the air circuit. When Butterfly Valve 2 is opened a little, the ram will cycle slowly. This has been a general description of the Air Circuit, some of its components and actions. The Cricket Air Circuit diagrams and Component Details (Long Story) section on the website explain the air circuit in greater detail (with photographs and diagrams). Information on the website also describes the implementation requirements for single-hit and clamp features not implemented on the original Thumper. If you want to consider implementing the single-hit and clamp features, you will need to use a larger cylinder to get effective use of those features. I consider the minimum length cylinder for using the single-hit feature is 10 inches. Also, the bore should be at least 2 inches for an effective clamp (larger bores present more clamping pressure). Web Template created with Artisteer by Richard Hammer.